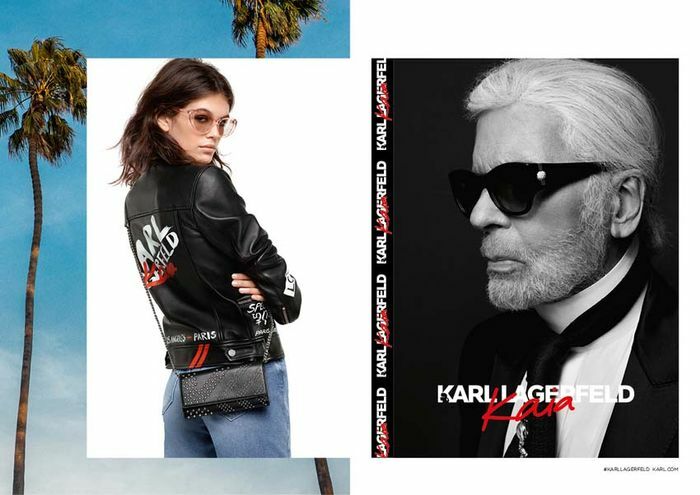 Of course I jumped at the opportunity to interview Kaia Gerber for her collaboration with Karl Lagerfeld. I left the office early so I had time to head home and change into something Kaia would hopefully think I looked cool in, and then I was off to Revolve Social Club to chat with the 16-year-old beauty. In case you haven’t heard, the Los Angeles–born model teamed up with the iconic Karl Lagerfeld to design a collection that’s exclusively on Revolve.com and Karl.com for the first two weeks. The Karl x Kaia collection includes everything from socks and sunglasses to staples like leather pants and the chicest black blazer dress. But back to my three minutes and 30 seconds with Kaia… Right off the bat, I could feel how passionate she is about the pieces. We talked about how she’d style the cropped white tee in the collection, the piece she’s pumped sold out first, and the one Parisian-inspired item every girl needs. The collab is the perfect mix of the laid-back L.A. vibes and polished Parisian wardrobe staples that embody Kaia’s style. Keep reading to find out more from my interview (like the French-girl item we all should own) and to shop the Karl x Kaia collection on Revolve. What’s the one Parisian-inspired essential every girl needs? I think the chic little black dress is really important. You can wear it day and night, and Parisians do it very well. Which piece do you think will sell out first? The sneakers are sold out, which is so exciting. I didn’t think anything was going to sell out that fast. On Karl.com, the sneakers were sold out last time I checked. What’s the one trend you won’t see in the collab? Neither of us are very trend-focused people, so we wanted to stick with the classics. I live in a things like a leather jacket, blazer, and a little black dress or black pants—whatever it is—and Karl does those classics so well. We definitely focused on the things we knew worked well and the things we love. What’s the coolest way to style the T-shirts from the collab? I think you can wear it with jeans or shorts or even the skirts. That’s what’s so good about T-shirts; you really can’t go wrong. Time to get shopping before these pieces all sell out!